23 Interesting Facts About Bhutan: Where Is Bhutan? Unsurprisingly, most people know very few facts about Bhutan. In fact, lots of experienced travelers aren't even sure where Bhutan is located! Although state-controlled tours are possible, Bhutan has deliberately remained closed off to protect old traditions. Despite being an impoverished country, only selective tourism is encouraged. The cost to visit Bhutan is set high, at least US $250 per day, perhaps to discourage influence from outside countries. Due to the cost, Bhutan was definitely spared from becoming another stop on the backpacker Banana Pancake Trail in Asia. Even television and internet access were banned until 1999! Surrounded by the Himalayas, Bhutan is a small country sandwiched between India and Tibet, just east of Nepal and north of Bangladesh. Bhutan is considered to be part of South Asia. With only around 14,800 square miles (38,400 square kilometers) of territory, Bhutan is roughly half the size of South Carolina. The country is slightly smaller than Switzerland. Much of the terrain is made up of mountainous slopes. Druk Yul — the local name for Bhutan — means "Land of the Thunder Dragon." The dragon appears on the Bhutanese flag. In 2010, Bhutan became the first country in the world to ban the production and sales of tobacco products. Smoking in public areas is illegal, however, tobacco can be used in private. In 1916, the first King of Bhutan called tobacco "the most filthy and noxious herb." Violators are slapped with a harsh fine: the equivalent of over two months' salary. In a push to modernize, the King of Bhutan finally allowed television and internet access into the country in 1999. Bhutan was among the last countries in the world to adopt television. A few television channels are received from neighboring India. The king warned that misuse of television could corrupt their old traditions. Bhutan has a mandatory national dress code. Men wear traditional, knee-length garments and women must wear ankle-length dresses. The colors give away someone's social class and status. The University of Texas at El Paso used Bhutanese architecture style as an influence when designing its campus. 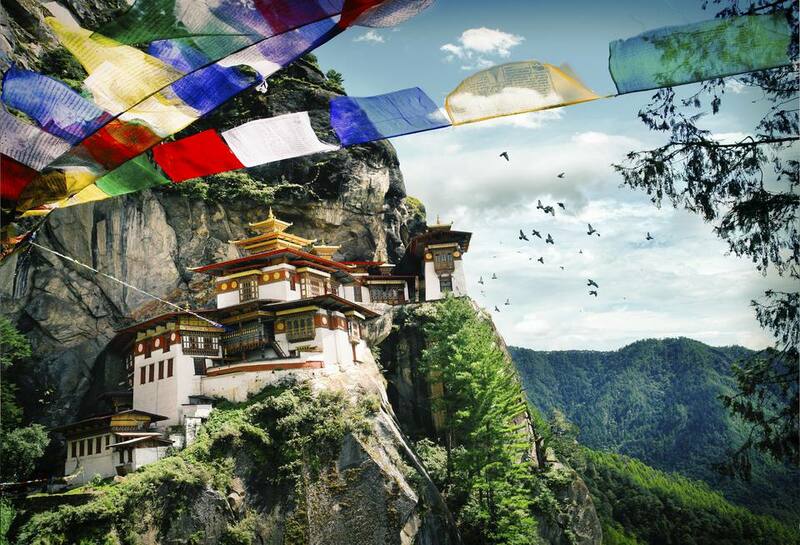 Bhutan is the only country in the world to officially measure national happiness. The index is known as GNH (Gross National Happiness). Rather than placing emphasis on GDP, Bhutan attempts to track the happiness of its population. The United Nations bought into the idea in 2011 and released the World Happiness Report in 2012. The annual report uses Gallup data and ranks countries by factors such as social, health, and environmental wellness rather than just economic concerns. Despite a focus on internal happiness, the Bhutanese government has been accused of numerous human rights violations against the ethnic minorities living there; many were forced out of the country or into refugee camps. The United States accepted 30,870 Bhutanese refugees between 2008 and 2010. Bhutanese receive free education from the government. A heavy emphasis is placed on Buddhist teachings. Most schools have an English curriculum. Until education reform was passed in the 1990s, only around 30 percent of males and 10 percent of females in Bhutan were literate. Inheritance (land, house, and animals) is generally passed to the eldest daughter rather than the eldest son. A man often moves into the home of his new wife until he can "earn his keep." Bhutanese are forbidden to marry foreigners. Homosexuality is also forbidden by law. Polygamy is legal in Bhutan, however, the practice is not common. The national sport of Bhutan is archery. Basketball and cricket are also gaining popularity. The state religion of Bhutan is Vajrayana Buddhism. Vajrayana follows tantric Buddhist texts. Bhutan is squeezed directly between two world superpowers who often clash politically: China and India. Bhutan controls many key mountain passes between the two countries. India and Bhutan maintain a friendly diplomatic relationship. Bhutanese may cross into India with only their national ID cards (no visa necessary) and may work without restrictions. Many Bhutanese go to India to continue education. Bhutan is still negotiating parts of its mountainous border with China. Aside from land disputes, the Bhutanese have very little diplomatic relations with their biggest neighbor. In 2005, Chinese soldiers began constructing roads and bridges — without Bhutan's permission — to gain better access to disputed territory. China also improved roads in Tibet before occupying. Bhutan became a constitutional monarchy with a two-party system in 2008. The People's Democratic Party won the elections in 2013. The Bhutanese Army consists of around 16,000 soldiers. The force is trained by the Indian Army and has a total annual budget of approximately $13.7 million. In comparison, a single M1A2 tank used by the United States costs $8.5 million. Bhutan's economy is growing very rapidly. Bhutanese currency, the ngultrum, is fixed to the Indian rupee — which is also widely accepted in Bhutan. Bhutan became a member of the United Nations in 1971. It was a founding member of SAARC (South Asian Association of Regional Cooperation) in 1985. Although basic healthcare is free in Bhutan, the country suffers from a serious shortage of doctors. In 2007, the physician density was one doctor per 50,000 people. In contrast, the United States has around 133 doctors per 50,000 residents. The average life expectancy in Bhutan is 69.8 years per the World Health Organization's 2015 data. Bhutan is one of the most closed countries in Asia. Visiting as an independent traveler is pretty much impossible — an official tour is compulsory. Although Bhutan no longer restricts the number of tourists per year as they once did, exploring the country can be expensive. To receive a travel visa, all visitors to Bhutan must book through a government-approved tour agency and pay the full price of the trip before arrival. The full amount of your stay is wired to the Tourism Council of Bhutan in advance; they then pay the tour operator which arranges your hotels and itinerary. Foreign travelers get very little choice of where to stay or what to do. Some Bhutanese claim that foreign visitors are shown only what the government wants them to see. Tours are censored to maintain a false image of internal happiness. The visa and tour agency fees to visit Bhutan average more than US $250 per day.